Better Angels Now » One of my Personal Favorites - Volume I: Mark Knopfler's "One Night in London"
One of my Personal Favorites - Volume I: Mark Knopfler's "One Night in London"
Publisher's note: A discussion I often have with my baby daughter, now 22, is on the condition of pop music; mostly her opinion, then mine. The short of it: She grew up around mostly my music from mostly my era, and she feels slighted by what has long passed for popular music in this present time (the last 15 years) of original music. It is not that there are only poor musicians today, nay, there are many good ones; however, the music, overall, from this era is very weak, and sadly, many of the good musicians that exist today, in the shadows of anonymity, struggle to get noticed. It's the old 'Chicken or the Egg?' conundrum: Which came first the bad music produced or the public's bad taste for that music? If it is a matter of exposure of the good musicians of old or the good ones here today, in the shadows, we at BCN will do our part to bring them to you, and to that end, we initiate this new series of informally bringing to you musicians that we, or mostly I, appreciate. Studies show that music, especially that which is good, can open the mind and expand one's own creative instincts to do innovative stuff, and appreciate that of others. We, at BCN, will continue to do our part to help all of us along this path toward spiritual awakening, and greater understanding of this great big world around us - now and then. We will expose these rare gems as time permits. Here is what we have up until NOW. Mark Knopfler, a fabulous musician, surrounds himself with other uniquely accomplished performers to bring us "One Night in London"
Mark Knopfler in the early days of Dire Straits. Appears courtesy of Mark Knopfler's personal site. It's Friday night, I'm out of energy, the funds are tight, and I just want to kick back, and 'keep the home fire burning' with 'The Missus'. Snuggled in at home, we made a near barrel of party mix - perfectly made it was. I had a rare few beers, and then we settled in front of our new 'smart' TV. I have only recently become smart enough to figure out how to search and find content to enjoy, something to do when I settle down the senses a bit from another long day of doing important stuff. This Friday night, I suggested that we find an extended source of music on YouTube - maybe a concert. My wife suggested Jackson Brown, but I countered with Mark Knopfler, long one of my favorites for so many reasons. From Dire Straights, to a smattering of film scores, to a variety of music genres as a solo artist, Mark Knopfler ranks alongside my similar super favorites: Van Morrison, The Band, Jimi Hendrix, Beatles, Bob Dylan, Joni Mitchell, Paul Simon, James Taylor, Eric Clapton (mostly Cream /Derek and the Dominoes), Led Zeppelin, Bruce Springsteen's (mostly his) first three albums, Allison Krauss and Union Station, John Williams, Aaron Copland, Ludwig, Amadeus and heaping handfuls more. My immediate search of YouTube found us Mark Knopfler: Live at the "Atrium" and "One Night in London". We actually watched both, so I had way too much homemade party mix, and almost too much beer (which would not take much for me at this point). 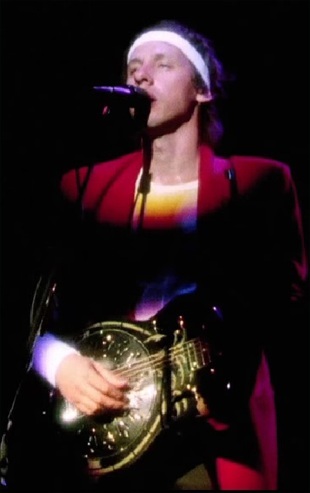 Mark Knopfler, with Dire Straits from the Alchemy Concert, in 1983, singing "Romeo and Juliet" (notice his Dobro-like guitar gleaming, which is the guitar he uses even now 'for the love song that he made'). The full video of the concert is at the bottom of this post. The "Live at the Atrium" gig was of good quality and just a couple of years back, but for the sake of brevity here, I will relate to you only the "One Night in London", which was done in 1996 when Mr Knopfler was 47 years old and showing a bit of grey in what hair he had remaining (Knopfler was born in 1949; Glasgow, Scotland). Otherwise, he was ready for a fine, fun evening, which did appear as much a joy for the audience as it was for Knopfler to perform. If you have ever watched Mark Knopfler perform, you will primarily notice two things: he is generous with his estimable talent as it relates to his accompanying band mates, and he is always exuding an enthusiasm of inert mirth - denoting that he certainly digs what he is good at - creating magical melody. When Knopfler enthusiastically began directing Dire Straits, at the ripe old age of 28 (ancient for Rock 'n' Roll guy), they were the real deal, proverbially hitting the public stage, with the right music at the perfect time. The inexorable flaccidity of Disco was waning, and someone had to emphatically restate: 'Does anyone remember Rock 'n' Roll?' Mark Knopfler did his part to not only ask the question, but professionally 'drive a few of the nails into the coffin' of that sorry genre of harmonic crap. I hated Disco. I loved Rock' n' Roll, and Dire Straits's titular first album was arguably as good as any first album ever made, Rock 'n' Roll or no. By the time the band had finished cutting: (1st)"Dire Straits" (1978), (2nd) "Communiqué" (1979), (3rd) "Making Movies" (1980), (4th) "Love over Gold" (1982), (5th) "Brothers in Arms" (1985) Dire Straits had put together a compilation of original music that would be envied by any other serious musician. But that ended in late 1985, when the band disbanded, and then again, finally for permanent dissolution, in 1995, after just making one more album, "On Every Street". Mark Knopfler in a recent photo: Above. Even when you are as accomplished as Mr. Knopfler is at playing his guitars, one must still practice: Below. All photos appear courtesy of Mark Knopfler's personal site. As a solo artist, from 1983 until 2002, Mark Knopler scored 9 films; the most notable of which are "Local Hero" (one of Burt Lancaster's last films - 1983; also a rendition of "Going Home", from that film score, is near the end of the show), and "The Princess Bride" (1987). Moreover, as a solo guy, Mr. Knopfler had the freedom to explore the multiplicity of music genre's outside of the Rock 'n' Roll context, even though as an English major and teacher, he always had a firm penchant for telling stories in his melodies, either in rhyme or tone. From "Romeo and Julitet" (1982) to "Brothers in Arms" (1985) and beyond, Mark Knopfler is one of the great balladeers of my generation and all succeeding generations as well - this I well know. He laces the cryptic words of his ballads with his unique tone of his many guitars to find that perfect mood from that story, for that moment, as he performs it right before your eyes. His spontaneous changes are subtle, but they add to the intense drama that is the essence of most Mark Knopfler ballads. It is as if his personal phrased words, his pitch perfect voice, his various guitars are always in perfect sync, and as extraordinary as this may sound, I have never seen his various bands not firmly in tow for his spectacular melodic ride - most always in perfect sync as well. "One Night in London" (1983) .. The Video Concert in its entirety: Below. With never a note wasted, Mark Knopfler employs his open handed picking style to play perfect pitch in the hearts of real music lovers, and if you are one of those of whom I speak of, you will love "One Night in London". This assortment of tunes are mostly ballads, some Irish reels Knopfler style, with some melodies symphonic in complex arrangement. While this night is most definitely in London, a great deal of the show has a strong feel of pure Americana, with strong influences of Country Western to Blues to Zydeco, and Rock. 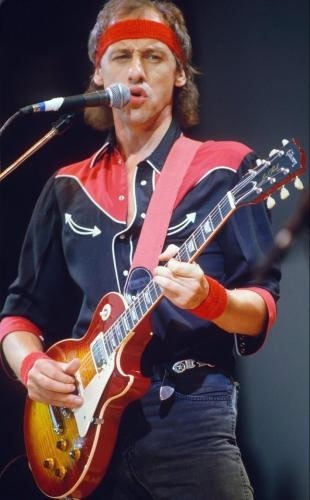 Two of Mark Knopfler's great influences were Americans Elvis Presley and Chet Atkins, so ... one can understand the diversity and richness of his song choices - including his legendary classics: "Romeo and Juliet" and "Brothers in Arms" from his Dire Straits days. In closing, I hope you take the time to understand the complexity of Mark Knopfler's vision of melody as it conforms to his pure expression of harmonic communication. In that pure artistic effort, he senses a world worth relating, and in that effort some may be revealed to be partially, or fully fulfilled. I was ... my wife was. It was a good Friday night as we kept the 'home fires' ablaze ... "You and me babe ... How 'bout it." - "Romeo and Juliet" (1982). As promised, I have provided the Dire Straits Alchemy Concert, when Dire Straits was fully in their prime. Remember how you looked and felt at 34 years of age. Couple that with being an instant success once you put the band together, cut an outstanding demo of 5 fabulous songs, and you might sense where Mark Knopfler was at that point in his professional life. Besides being a great creator of melody, one of the greats of the last 50 years, I have always considered Mark Knopfler one of the 10 greatest guitar pickers that I have ever heard, and I've heard, and know, more than my share. In this concert, with mark in his prime, please pay close attention to his unique open hand picking style. It offers a slightly duller tone than the pick, and a range of control that is Mark Knopfler's hallmark. If you are not captivated by the first tune of the show, "Once Upon a Time in the West", and get swept into the Rock moment, and feel so inclined to venture forth to seek more, like an extended version of "Sultans of Swing" (5 songs in, just after "My Investigation"), which just kicks it up quite a few big notches, then you better check to see if you still got your Soul intact. Just a tease here: After the second tune, "Expresso love" (a second great rocker), mark performs "Romeo and Juliet" - one of the greatest love ballads of all time ... all time. Just for kicks, compare this 1983 version with the 1996 version that Mr. Knopfler performed in "One Night in London". A uniquely different version but still quite beautiful.